The Go Direct Conductivity Probe determines the ionic content of an aqueous solution by measuring its electrical conductivity. Go Direct Conductivity Probe determines the ionic content of an aqueous solution by measuring its electrical conductivity. It features a built-in temperature sensor to simultaneously read conductivity and temperature. Automatic temperature compensation allows students to calibrate the probe in the lab and then make measurements outdoors without temperature changes affecting data. This temperature compensation can be turned off to perform conductivity studies as a function of temperature. 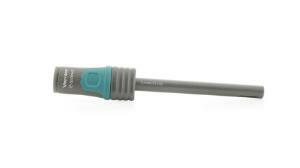 The Go Direct Conductivity Probe has a range of 0 to 20,000 μS/cm to provide optimal precision in any given range. An alternating current at its electrodes prevents polarization and electrolysis, reducing contamination of solutions. Its ABS-body graphite electrode resists the corrosion typical in metal electrodes. Our Go Direct™ Conductivity Probe connects directly to your mobile device, Chromebook, or computer using our free Graphical Analysis™ 4 app—no additional equipment or software purchases are necessary. Go Direct sensors can be used wired via USB or wirelessly via Bluetooth, allowing you to choose the solution best for your classroom or laboratory.